Langer Lake is located just inside of the Frank Church Wilderness, in central Idaho’s Salmon River Mountains. The lake is nestled amongst a handful of other alpine lakes, and is a popular day hike destination in the Cape Horn area, and also makes for a nice short overnight backpacking destination for young families. 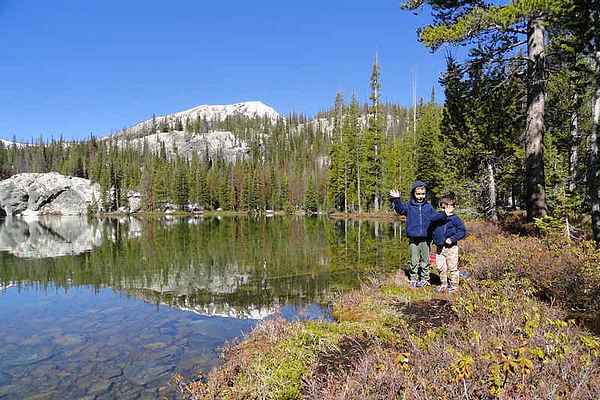 My sons (ages 4 & 6) and I were looking for a lake destination that would be under 5 miles round trip, not too long of a drive, and snow free. Langer clearly fit the bill on the first two requirements. I’d been checking the SNOTEL sites, and it looked like the south-facing trail should probably be snow free. Done deal. We arrived at the trailhead just before 5pm. The trail is steepest at the beginning, but we still made pretty good time since the boys were excited to get to the lake for a quesadilla dinner. As we climbed up the hill and into the burn area, the thunderclouds were starting to rumble all around us. Oh well, onward and upward. At about 7900’ we started seeing snow covering various spots in the trail. Soon the trail was covered, and we headed cross-country trying to dodge snowfields. My oldest son suggested that maybe next time I should bring along snow-boots to be better prepared. About that same time, the clouds began to open up on us and I had to break out the 79-cent ponchos. Our pace had slowed considerably, and spirits weren’t exactly high, so we stopped for a granola bar to regain some energy. Not long after that came the first creek crossing. It was flowing pretty fast, and there was nowhere the boys could make it across, so I took of my boots and socks for some wading. First one son, then the other. Brrrr. On we went, and reached the next creek crossing. I could see the lake up ahead, but the water was much broader here. Off came the boots and socks again. I picked up my youngest son and waded across one snowmelt marsh to a small island. The next step was very memorable. The footing looked firm, but the combined weight of me, the 48lb pack, and my 40lb son was too much for the grass and silt beneath my feet. I sank in to the middle of my thigh. Double brrrr. I tried a couple more steps, but it just got deeper so I did my best pirouette and climbed back up onto the island. Time for plan B. I carried my son back to the shore, and then did some barefoot scouting along the north shore of the lake. Snow and streams were everywhere, but I eventually found a campsite and dropped of the pack before heading back to get the boys. I did a series of double carries, one son and then the other, to get them to the campsite. After oatmeal and some exploring, we packed up to begin the hike out. I left the boys in their PJ’s to preserve some dry cloths for after the snowy section. On the way down, we stayed well north of the trail where there were fewer trees and much less snow. This worked great, and even the creek wading went much easier. Soon enough we dropped back to the trail for a change of clothes and some easy downhill hiking back to the car. The boys seemed to forget about the prior evening, and even told me I was the greatest daddy ever for taking them hiking. Believe it or not, they’re already asking about the next trip, although they have stipulated very clearly that we have to go somewhere without snow, and that daddy needs to pay more attention to the weather forecast. Map of our route. Just under 5 miles and 950' elevation gain round trip. Passing into the Frank Church Wilderness. The trail gets less steep as you enter the burn area. This is the last we'd see of the trail until the next day. Ponchos, one size fits all? Our campsite at Langer Lake. Our moods got much better when the sun came out. Crawling under a fallen tree.